For the first 14 days in April 2011, Dave Cornthwaite and myself will be attempting to ride a tandem bike from Vancouver to Las Vegas. The distance is 1400 miles and before you say it; yes- we fully realise that we won’t be able to sit down for a very long time after the journey! What’s harder than trying to clear US customs having flown into the country? Trying to clear US customs having ridden a tandem bike into the country! Customs border control: ”And where exactly are you boys heading on that thing? Customs border control ”Are you joking with me? The aim of the our first stint on the road was to get used to our new bike. This of course took some time and as we wobbled and wrestled it down the side of the freeway with a clown’s horn fitted the front handle bars, people must have thought we were a pair of idiots. In terms of casualties, Dave has declared both his buttocks clinically dead and I have a knee which every now and then lets me know he’s hurting but to be honest our excitement far outweighs these little annoyances. Let me tell you; we are pumped to have knocked over 90 miles after what was a late start to the day. Tomorrow with some nice weather again (no rain! ), we’re hoping an early start will land us somewhere towards Olympia by nightfall and other than that we just hope that our already sweaty and smelly bike gear dries out by the morning! I could give you more details but I think i’ll save us the embarrassment. Before I leave you today, you might find this little video entertaining; it’s the moment we first tried riding a tandem bike together! Now yesterday Dave and I were talking about the responsibilities of the front and rear rider (in fact Dave spoke about it in his blog below) and one thing we both felt was that when steering in the front seat, you feel a huge responsibility for not only your own safety but more importantly your mate behind. Ultimately as the steerer, you’re in control of where the bike goes. This is the reason I feel terrible right now because when we crashed I was the one steering and as a result of this; I’ve hurt my mate, potentially quite badly. At roughly 4pm this afternoon a snap-snow storm hit the southern suburbs of Portland, Oregon. Luckily we missed it, by only 10 minutes, and so by the time we got there the streets were literally covered in snow. Naturally, feeling lucky that we’d missed the downpour, we got the camera out and began filming the Christmas-like landscape. It was awesome! As we did this however, our bike picked up speed down a hill and although seemingly in complete control, a sudden railway line which ripped awkwardly through the 2-lane road caused the back wheel of Tinkerbella (our bike) to slip out. The result was a very ungraceful dismount at about 15 mph, straight onto a snow-covered grass verge to the side of the road! Now i’ll admit that whilst laying in the snow, my first reaction (probably much like yours) was to laugh at the fact that two fully grown men had a crashed a tandem bike into snow, BUT this stopped immediately when I realised that laying beside me was Dave, and he was hurt. He had somehow managed to twist his knee in the fall, and in words that we’ve had to bleep out of the video below (Yes, we did catch the crash on camera!) he made it known that he was in pain. It seems that he’s strained some ligaments. It’s times like these that people reveal their true character and although Dave’s head may swell in a nature similar to his knee from hearing this; I’d have to say that Dave is an absolute battler. After a moment of assessing his leg, he got to his feet, brushed the snow from his clothes and in between gritted teeth, demanded we hop back on the bike and start peddling before the pain got worse. 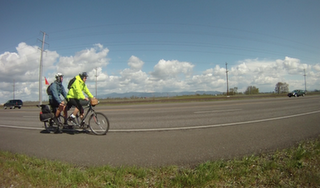 Twenty-five miles later; we reached our destination of Woodburn, Oregon. Although wincing most of the way, Dave peddled hard for the duration. As I type, I’m looking at the red-headed adventurer who is lying on his bed with an ice-pack on his right knee. Although we don’t know exactly what damage has been done, we’re both now hoping that by 6am tomorrow morning he’s feeling OK to peddle some more. This is what makes these types of journeys so rewarding; bouncing back. We’ll keep you posted. Pardon the missed update yesterday but I fell asleep within 20 minutes of finishing riding. You could say it’s tiring work. Up until yesterday, Dave and I had been enjoying the hospitality of the flat landscapes that adorn much of Washington State and Northern Oregon. This however, as we’ve been finding out over the last 2 days, is changing with every mile we peddle south. Put simply, we’re currently in the middle of a mountain range. This morning, for example, we scaled two 2,000 feet summits within 10 miles of one another. This though is just the beginning. As we speak, Dave and I are resting up in a motel in a place called Ashland. Through our window we are able to see the road we’re taking tomorrow; it’s the interstate-5 and it leads straight up the side of another mountain which peaks at 5,000 feet. This peak is actually the first of 6 similar sized mountains that we face in the next two days. 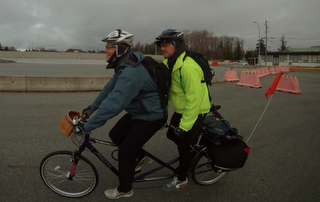 This typically would be a scary proposition, but considering we’re riding a tandem bike; it’s hard not to laugh! When Dave and I started on this journey just 7 days ago, we were of course full of excitement for the challenge but in honesty we had no idea whether it was possible or not. We’d never ridden a tandem bike before, after all! Right now we’re just trying our best and that’s what’s making this even better; the unknown. We aren’t looking at the destination of Vegas here, instead each day we look just 100 miles down the road and that’s what we focus on. To date we are just about on target but with the mountain stage just ahead, things will certainly slow down over the next day or two. So, does this mean that we won’t make it? I don’t think it does. You see, yesterday evening as we climbed our last hill before pulling into an inn in Wolf Creek (OR), I had a strange moment; the sort of moment that I live for. With sweat beading into my eyes; grit flicking up into my face and my muscles letting me know that they don’t like me, I broke out into a huge smile and I’ll admit I felt an incredible sense of euphoria. In some kind of introspective moment where I forgot about what it was that I was actually doing at that moment in time, I felt a huge sense of satisfaction; I was exactly where I wanted to be. I was out of my comfort zone, challenging myself mentally and physically, all whilst trying something that has no guarantee. The unknown. I’m not sure where i’m going with this exactly, but based on that brief moment of clarity, I know that we’ll make it to Vegas. Dave and I are making it happen because we wouldn’t rather be doing anything else in our lives right now. These days are tough! Its the end of Day 10 today and I should start with an apology of sorts; I haven’t updated you on this journey as much as I would have liked over the past ten days. Sorry! I’ll be honest though, I’ve never felt so tired in my life! An early start at 6am see’s us peddle for 30 or so miles where we grab a coffee and a doughnut at about 11am. After that we push on until about 1pm where typically we have a bout 55 miles under the belt. A large order of MacDonalds usually fills our hunger at this stage before we then set off to peddle to around 7pm. If all has gone well, we’re usually at the 100 mile mark by nightfall. This is of course forgetting about snowfall, rain, wind and more lately mountains. By 8.30pm, we’re usually asleep. It’s tiresome. What’s more; the huge inclines that we had been warned about weren’t as bad as expected and so it only actually took us a little over 1 day to cross the mountains! Because of this I type this from Reno, Nevada, and I am stoked. 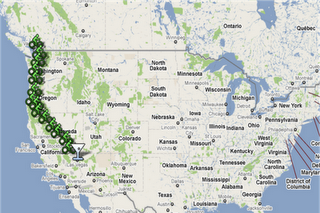 Our trip is getting done, and on a map we can see progress! What does this mean? Well in short, having now cleared the mountain-stage of our journey, we eagerly left looking at the imminent desert-stage; a 4-day period which will take us to Vegas. We’re excited. Excited and tired. I wish I had more time to talk but I’m in a MacDonalds (of course) that is about to shut. I sit here writing this from the middle of a desert. I’m in a tent with the door open and a full moon is shining brightly down on the surrounding plains. There isn’t a breath of wind in the air and silence surrounds us. When I say us, I’m talking about myself and Dave. For the last 13 days we’ve been doing something absolutely ridiculous; attempting to ride a tandem bike from Vancouver, Canada, all the way to Las Vegas, America. Previously never attempted (for reasons that are fairly obvious), the 1400 mile journey thus far has led us through flat baron wastelands, city centers, snowy mountain passes and currently high-desert. Roads that seem as endless as they are foreign to us, have introduced us to freezing temperatures, sporadic snow-fall, heavy rain and even the occasional crash along the way. It’s because of all of the above variables that I can’t believe I can now tell you that tonight, on night 13, we are actually less than 100 miles from our destination; Las Vegas. It’s incredible. 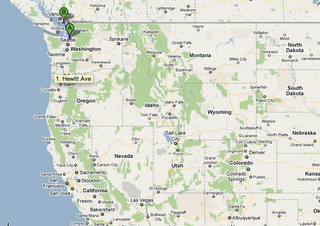 We’ve travelled 1300 miles so far. The concept of timing is something that I’ve been thinking about today; after all when you peddle down a straight road through endless plains for 10 hours straight, there isn’t much else to do. When Dave and I first forged this bizarre plan to take a 2-seated bike the majority of the way across America, it came by way of on an invitation by an Australian company who wanted us to give a motivational talk at their annual work conference in Vegas. We knew we wanted to do the talk but thought that instead of flying all the way to America for a 1-hour presentation, we’d try and incorporate an adventure of some sort into the trip as well. A 5-minute discussion decided that this would involve a tandem bike journey from Vancouver to Vegas; I’d always wanted to test myself on a bike and Dave wanted to travel 1000 miles on one (Expedition 1000). It made perfect sense. The talk itself was scheduled for Sunday, the 17th April, as such we were told that we had to be in Vegas a day early on the 16th (tomorrow). Having absolutely no idea about distances, landscape or even the physical nature that would present itself with our challenge, we said ’no worries, we’ll be there!’. 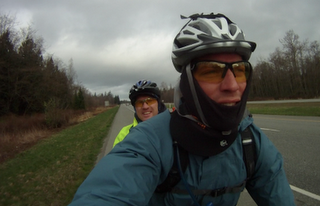 The funny thing was that due to other commitments, the earliest that we could start the ride was on April 3rd. This gave us just 14 days. Without a second thought, we flew to Vancouver. Tomorrow we anticipate that we’ll arrive in Las Vegas somewhere in the afternoon. 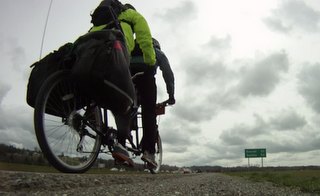 The last 13 days have taught us that it will take us almost an entire day to cycle the 100 miles required. This though amazes me. How on earth, after what has to be said was one of the most loosely prepared adventures that Dave or myself have been involved with, will we make it to Vegas at exactly the right time? For all we knew, this 1400 mile journey could have taken 2 months, but as it happened it took the precise 14 days! There’s something strange about this that I can’t get my head around. With our first peddle out of Vancouver, we had huge smiles on our faces, and like wise with our last peddle today, we again were smiling proudly. We were excited about the challenge. From Day 1 to now we had a goal in mind; get to Vegas by the 16th April. A simple goal on paper that when committed to our minds, we prioritized above all else. For the last 13 days there hasn’t been anything else that we’ve thought about and as such in a way I can’t quite explain we’ve subconsciously made it happen. It’s the same way that we used to always only just get our assignments in on time at school and even the same way that no matter how intense the urge is we always just make it to three bathroom on time (in Dave’s case today; it was a rock on the side of the road). I think put simply, when we put our minds to something, and truly give it our true attention and belief, we as people can accomplish anything. For us, on this occasion, it was to peddle a comical bike that we named Tinkerbella a long way in 14 days, but for you it may be something completely different. That is the point here that I think is most important; anyone of us can accomplish any numbers of goals or dreams; the only thing you need is belief. Belief followed by application and commitment will enable success (even if you don’t own a tandem bike with a front-basket). This journey, simply put, was incredible, but this challenge was not just about cycling; it was about throwing ourselves at a goal completely unknown to us and by doing so; testing ourselves. We could have failed of course and by the same token we could have succeeded but either of these outcomes would have been valuable to us as a people. We wanted a test. As it happens tomorrow I along with Dave will be peddling Tinkerbella down Las Vegas Boulevarde with ridiculous grins strapped across on our faces. Those in the streets at the time may think we look quite odd, but that doesn’t matter, we both know that we’ve both ticked off a goals that we set our minds to. Is there a better feeling in the world? I don’t think so. Maybe that’s what we’ll speak about at the talk on Sunday? I’m still trying to digest the strange feeling I have inside now that Dave and I are in Las Vegas. It’s a mixture of surprise, excitement, accomplishment and euphoria. 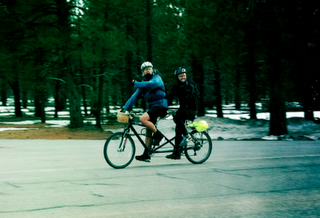 We managed to do it; we cycled Tinkabella (our Tandem Bike) all the way from Vancouver to Vegas! Yeeeoooooow!! Dave tells a story during one of our joint speaking programs where having skateboarded across Australia from West to East he climbs to the top of a hill and sees the glistening skyline of Brisbane for the first time in his life. This was his destination. Without being able to help it; he began to cry. Up until that point Brisbane had just been a place on a map but at that moment he realized that it was so much more; it signified the realization of one of the biggest accomplishment in his life. Now admittedly me and Dave like to have a laugh at each others expense and occasionally I rib him about crying like a girl, but I’d have to say that two days ago, when we cycled to the top of a hill in the Nevada desert and were met with a view of the glistening Las Vegas skyline, I too got a little emotional! I won’t go on but let’s just say that both Dave knew that we had reached a point that we had both been working hard for over the previous 14 days. We had pedaled 1400 miles in 14 days! Last night, the final stage of the trip played out as we presented our journey to a room full of 700 corporate delegates at Planet Hollywood. It was epic! With Dave on one side of me and Tinkabella on the other, I’ve never felt more comfortable. On top of that, we were also able to raise a substantial amount of cash for both of our charities; Camp Quality and the AV Foundation. Thanks to everyone for their generosity! Awesome! I should in the first instance I’d like to thank Professional Investment Services for inviting us to talk in the first place; after all, without them we would have had absolutely no reason to conjure up such a brilliant and strange adventure in the first place. A truly fantastic bunch of people, Dave and I are very happy to be able to announce that for 3 weeks in May, we will be working with PIS to present a 3-week speaking circuit in all Australian capital cities. We can’t wait! If you’d like to see us speak, please just let me know info@100things.com.au. I’ll be posting our speaking schedule closer to the time. Before then though, there is one more adventure that I get to try out and that starts on Saturday; I’m about to tick off Number 10- Chase a Tornado! I’ll tell you more about that tomorrow though. This is one I’ve been looking forward to for a long time and just quietly I’m over the moon that it doesn’t involve cycling!